"ENGINEERED TO LEAVE NOTHING BEYOND YOUR CONTROL"
Lean materials and efficient new processes forge the light, stiff Stingray space frame, which helps achieve 50-50 weight distribution and impressive power-to-weight ratio. One-third the weight of steel, aluminum improves rigidity, which in turn enhances cornering and handling. Lightweight carbon-nano-composite underbody panels bond to aluminum, further reducing weight for more precise driver control. This revolutionary chassis improves torsional rigidity, reducing noise and elevating performance to an art. Completely redesigned, the 6.2L LT1 V8 engine boasts up to an estimated 460 horsepower and an available 465 lb.-ft. of torque, plus it achieves a 0-60 time of 3.8 seconds. A distinctive rear transaxle layout achieves optimal weight balance. A trio of innovative technologies rarely seen in any elite sports car achieves revolutionary power and fuel efficiency. Compact engine design lowers the hoodline and vehicle center of gravity. And a dry-sump oil system, available with the Z51 Performance Package, delivers through high g-force cornering. 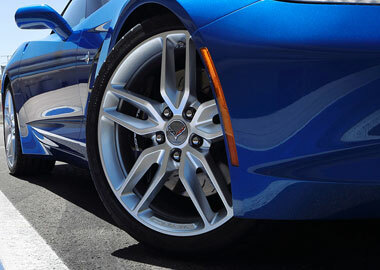 A 7-speed manual transmission complements the LT1 V8 powerhouse that propels Stingray. The rear transaxle location enables a 50/50 vehicle weight balance. Intelligent sensors enhance the driving experience by simulating heel-toe shifting perfection at the touch of a switch. Active Rev Matching anticipates gear selections and matches engine speed for smooth transitions during both upshifts and downshifts. An available all-new 8-speed paddle-shift automatic offers smooth control with quick and precise shifts and manual mode for higher level of driver control. The 8-speed automatic delivers dual-clutch performance without sacrificing performance. Stingray incorporates the world’s fastest-acting suspension. Magnetic Ride Control™ is an available real-time damping system that “reads” the road every millisecond and can adjust in under 15 milliseconds. Available on the Z51 Performance and Handling Package, Magnetic Ride Control includes Performance Traction Management, which features five settings tailored to driver skill level and track conditions. The available Z51 Performance Package includes dual brake ducts that transport air from the front grille through the wheelwells to effectively cool the front brakes and expel heat. This efficient airflow controls temperature, reduces brake fade and optimizes stopping performance. Frosted indirect high-intensity discharge headlamps are the eyes to the technological soul of the Stingray, emanating crisp color, brightness and efficiency. The new elements bear a sharper, more sinister shape, framed by edge-lit amber LED turn signals and black chrome housing. 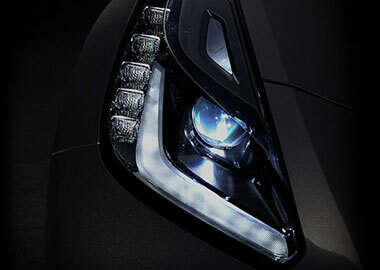 Bi-Xenon HID technology achieves high and low beams with a single light engine. 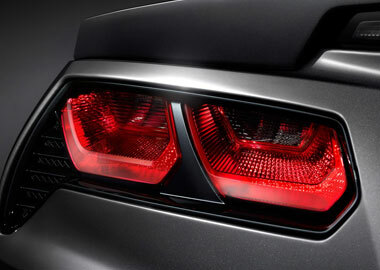 Signature four-element taillamps bear a new angular shape and recede elegantly into three-dimensional sculpted lenses. Concealed indirect LED lamps cast light into a reverse reflector to achieve crisp and even luminescence. A high-mounted stoplamp crowns the rear decklid. It’s design that doesn’t look back. Napa leather, available on the 3LT trim level, is a testament to the finely crafted interior of the Stingray. Free from imperfections and soft to the touch, its smooth, natural grain dismisses the notion of synthetic textures. The 3LT package also includes a hand-stretched, leather-wrapped instrument panel swathed and sewn to meticulous fit and finish while lightweight aluminum accents adorn the doors, pedals, shifter and cockpit instrumentation. The intuitive instrument cluster bears two ultra-bright 8-inch diagonal high-definition color LED screens — screens so bright they can even be read with the top down in direct sunlight. The center console entertainment interface features a retractable, tablet-inspired touch-screen complete with customizable home screen. And an available color Head-Up Display projects critical data into the driver’s line of sight on the windshield. Designed exclusively for Stingray and hand-wrapped in natural leather (or sueded microfiber if you choose the Competition Sport seats), a smaller, race-inspired steering wheel enhances grip and driving feel. A discreet, flat Euro-stitch lends a subtle but crafted feel. Steering wheel-mounted paddles initiate Active Rev Matching on the manual transmission or manual shifting on the paddle-shift automatic transmission. The standard GT seat begins with a lightweight magnesium frame and cradles the driver for optimal comfort and support. Precision hand-stitching hugs each and every contour. The 3LT trim level offers Grade A Napa leather or available sueded-microfiber inserts. It’s already the quickest, most capable standard Corvette ever made. But Stingray has also evolved to keep you connected and entertained. The Chevrolet MyLink system begins with a retractable 8-inch diagonal high-definition color touch-screen. Using steering wheel controls, hand gesture recognition and voice recognition capabilities, you can talk and text hands-free, stream third-party music services like Pandora® Internet Radio, plus access a broad range of functions including OnStar® and available navigation. Stingray offers a standard 4G LTE with available Wi-Fi® connection that’s more powerful than a smartphone or mobile hotspot. Through OnStar®, this technology gives Stingray an incredibly reliable Wi-Fi connection. The powerful signal gives you and your passengers the ability to seamlessly connect up to seven smart devices to the Internet, giving you the freedom to roam while connected. Our safety philosophy emphasizes prevention with features such as Active Handling and 4-wheel antilock brakes to help you stay in control, while standard high-intensity discharge Xenon headlamps shed 900 lumens of light onto the road for excellent visibility. And if Stingray ever loses tire pressure, run-flat tires enable safe functioning for some distance at a moderate speed until the tire can be repaired. In the event of a collision, Stingray is designed to help keep you and your passenger safe with seat-mounted head and thorax air bags, repositioned safety belt mounts, and a rigid aluminum frame structure that is 57% stiffer than the previous-generation Corvette steel frame. You’re never alone with OnStar® Automatic Crash Response. Built-in sensors can automatically alert an OnStar Advisor, who is immediately connected into your vehicle and can request emergency help be sent to your exact GPS location — even if you’re unable to respond. Standard for the first six months.